ANYONE WHO HAS ever wondered about the historical origins of the word “eh,” or why Canadians call a couch a “chesterfield,” will want to explore the new edition of a forgotten volume of Canadiana. 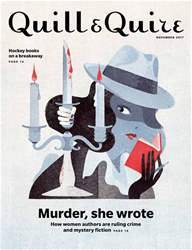 Murder, she wrote: How women authors are ruling crime and mystery fiction; Hockey books on a breakaway. If a tree cries, does anybody hear?